More of the same from 2017 to 2018. And more improvements have been made to her to make her even more potent and amazing to ride. Even after all these years and over 128,000 miles, this is still my favorite bike to take out on frequent rides. Only, this year she developed a valve oil seal leak that sidelined her just as the season was beginning. No matter. 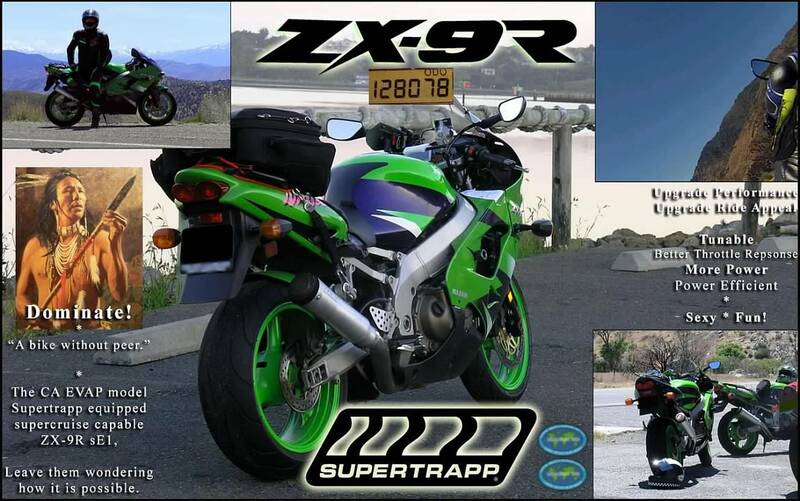 It's still been a brilliant riding season on my other SuperTrapp equipped 9R as well (see bottom right image). Here she is (main picture) out doing what she does best, taking me on long sportbike journeys. My magic carpet chicane scalpel. And here is some of the action we captured. Lastly, what is it like to ride a sportbike in its element for over 200 miles between fuel stops? Granted, this wasn't a test or set to turn out this way, it was simply what was captured on video from one of the many rides this year. In 2019, I plan on setting a more proper point-to-point time lapse ride in much the same way as this one was captured, with two exceptions: one, there will be no intentional stops; and two, the distance will be at least 240 miles between refueling. For fun, keep an eye on the bike's trip counter When she has somewhere to go, there's very little that gets in her way. Absolutely amazing! 128K on the clock, testament to the bike and your maintenance! Good job.